Advanced Motor Controls' programmable microprocessor-based ProCS™ Series ensures improved monitoring accuracy and faster response times. Advanced Motor Controls, a Group CBS company (http://www.groupcbs.com) that specializes in electrical equipment manufacturing, remanufacturing, and life extension services, is proud to announce its new UL-508A-certified Heat Trace Panelboards (HTP). Advanced Motor Controls’ ProC™ and ProCS™ Series HTP are designed for use in natural gas, petroleum, chemical processing, and related pipeline operations. Heat tracing maintains process temperatures for reservoirs and piping that must store or transport substances that solidify at ambient temperatures. Heat Trace Panelboards monitor electrical resistance in the heat-tracing system. Typically, heat-tracing systems include electric trace heaters, support components, and other electric heating devices that are external to the Heat Trace Panelboard. When the HTP detects an impedance change, it triggers a response of the external components in the heat-tracing system. Advanced Motor Controls offers two lines of Heat Trace Panelboards: our ProCS™ Series and the ProC™ Series. The ProCS™ Series, our flagship product, uses a solid state programmable microprocessor-based HTP, resulting in fewer nuisance trips for better control during auto tune and setup, improved monitoring accuracy, and faster response times, all while simplifying the installation of high-circuit-count panels for “plug-and-play” operation. Many heat trace panelboards are installed in isolated locations with long cable runs that result in normal ground resistance of 5 to 20mA, just below trip levels for a standard 30mA circuit breaker, which makes the ProCS™ Series a perfect solution. For shorter runs and more simplified applications, we offer an economical solution, the ProC™ Series Panelboards, which use a standard 30mA ground fault circuit breaker. Advanced Motor Controls’ Advanced Heat Trace Panels can be fabricated as floor or wall-mounted enclosures, and include a panelboard distribution center, power distribution block, control power transformer, and microprocessor-based ground fault relay or standard 30mA ground fault circuit breaker. 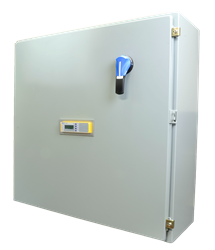 The panel has options for an integrated main circuit breaker, main contactor, alarm relay, alarm horn, door disconnect, hand/off/auto selector switch, and push-to-test lights on the panel front. Taken together, these features mean that Advanced Motor Controls’ Heat Trace Panels offer advanced features common to high-priced panelboards with minimal cost and lead-time. Advanced Heat Trace Panels come in a variety of NEMA-rated enclosure types, including NEMA 1, 3R, 4, 4X, and 12. In addition to these stock solutions, Advanced Motor Controls also can build custom panelboards to a specific user’s electrical service requirements. Advanced Motor Controls’ Advanced Heat Trace Panels are available immediately with an average lead-time of less than four weeks for standard panelboard configurations. For more information, contact Advanced Motor Controls at 972-579-1460, by email at dmuir(at)advancedmotorcontrols(dot)com, or visit the company’s website at http://advancedmotorcontrols.com/heat-trace-panel-boards.htm.